"Do you believe you believe you Be Obsessed or Be Average?" Managing two local top-40 radio stations in a privately owned network requires an understanding of the local market. In this case study, we will examine the possibility of acquiring new stations in a medium-sized southeastern radio market. Umphrey Broadcasting owns 26 stations in similar markets. The owners are seeking to expand the Network’s holdings by purchasing three FM stations in the same market as WZBR AM/FM. As the manager of both WZBR stations, I am responsible for supervising the daily operations. However, the Network owners have requested that I also analyze other local stations to find those that would be the most ideal for acquisition (Albarran, 2017). “WZBR AM plays a traditional country-and-western format that draws” an audience in the “50 and over” demographic, “while the FM station programs a country format featuring more contemporary artists” (Albarran, 2017). "The FM station draws a 35 -54 adult audience. In this market, there are seven other AM stations and seven other FM stations” (Albarran, 2017). Because the FCC rules state that in a market with 15 -29 stations, a single owner may only operate up to 6 stations, with a limit of 4 in the same class” (Albarran, 2017), we can add the three FM stations without violating our agreements. First, let’s take a look at the overall demographics. Table 1 is a list of the Market Characteristics associated with the 14 other stations near WZBR. The population of listeners is 112,700, which includes 57,500 Women and 54,800 Men. The under 17 market has a combined total of 12,350 children, which means that the adult, 18 and over market has 100,350 listeners. Since we already have audiences in the 35-54 and 55+ demographic, I will be aiming to find stations in the 18-34, 18-49, 25-34, and the 25-49 market. The gender estimates are reasonably even, so I will not analyze them in this assessment. 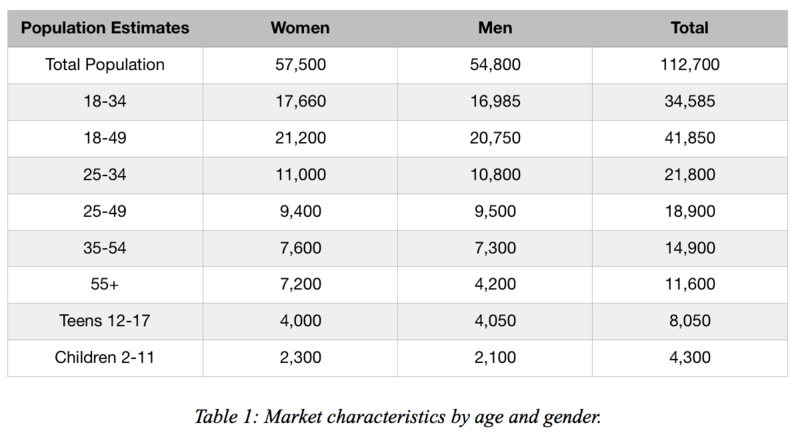 However, I will examine the Ethnic Composition, Occupation, Education and Household Income in this market (See Tables 2 & 3). Table 2 shows that the majority of the audience is Anglo Saxon (65%) and that there are more Hispanics (19%) than African Americans (11%) in this area (Albarran, 2017). I will only focus the genres preferred by these three ethnicities. I gathered some data from a Statista survey called, Public Opinion on Music Genres which are Representative of America Today in the United States as of May 2018. 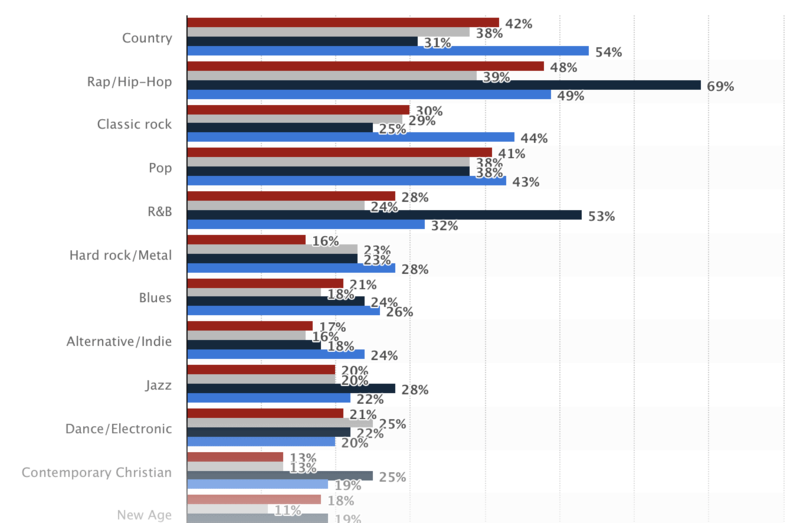 The data reveals that Country, Rap/ Hip-Hop, Classic Rock, Pop and R&B as the most popular music genres in 2018, amongst all ethnicities (See Table 2.1). Table 2.1: Public Opinion on Music Genres which are Representative of America Today in the United States in 2018. The data in Table 3 quantifies my choice between ethnicity and music genres as well. I chose three Occupations and three Household Incomes to compare to the data from the Ethnic Composition and Education Research in Table 2. My choices are the White Collar (29%), Blue Collar (27%), and Service Occupations. Then I added three incomes to compare. The households that make $60,000-$99,999, $30,000-$59,000, and Less Than $30,000. Doc Reo's data is collected from the Albarran, 2017 case study assignment. It is easy to make assumptions when analyzing demographics, but as an electronic media manager, it is more important that we review available data from several sources, to create a more comprehensive report. Broadcast industry professionals utilize formulas to gather data about local station ratings, market share, and time spent listening, as well as turnover rates. In this case, we will be estimating the station's listener loyalty or Time Spent Listening (TSL) and the rate in which listeners flip to another station, within a quarter of an hour. That is the Turnover rate (Turnover). The formula to measure listener loyalty is TSL equals the Average Quarter-Hour Persons listening divided by the station’s overall reach. The audience reach is also called the cumulative audience (Cume Persons). “Turnover is an estimate of [listeners who change] stations in a particular time period” (Albarran, 2017). Table 4 shows the “Existing Stations: Characteristics from Recent Ratings Report. While examining this report I used the formulas to find the stations that would be ideal for our network. I also kept in mind the Country stations listed that are similar to WXBR FM. 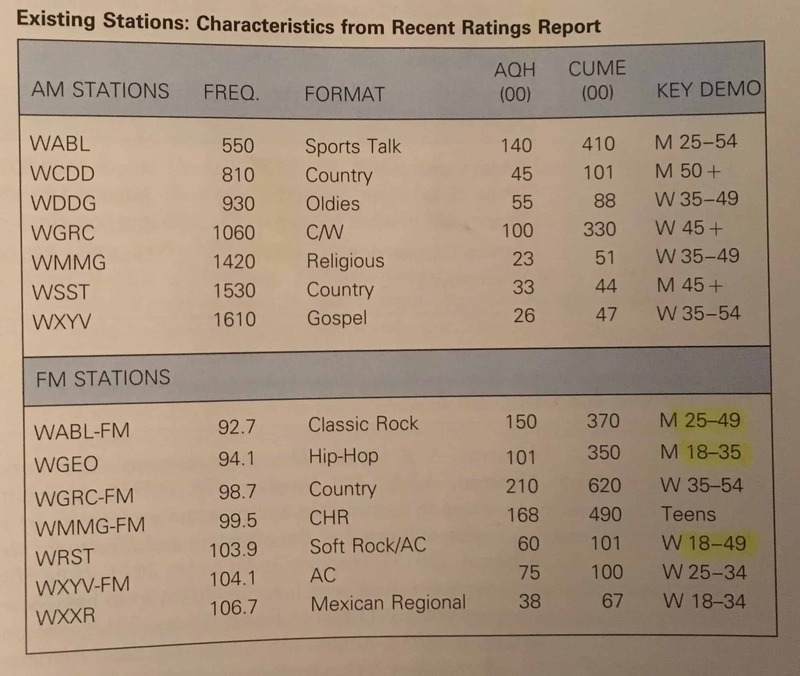 Out of the 16 stations in this market, including WXBR AM/FM, there are six with a Country Music format. Therefore, I chose to examine stations that would not compete with WXBR FM. After examining the demographics, I initially opted to only select stations that have an 18-49 audience. Then I started to estimate the TSL and Turnover, and that’s when I realized that it would be more beneficial for our network to purchase the FM stations with the highest Cume Persons. The three stations I selected are WABL-FM Classic Rock, WGEO Rap/HipHop, and WMMG-FM CHR (Contemporary Hit-Radio). The highest Cume in the area is WGRC-FM Country, which most likely means that WZBR-FM has a comparable reach. The Classic Rock station WABL-FM has 40% listener loyalty with a 2.5% Turnover. WABL-FM has an audience of Males 25-49 and is my first choice. My second choice is WGEO Rap/hip-hop. It has a 28% listener loyalty rate with a 3.5% Turnover. The listener base is Males 18-35. Now my last choice was easy until I realized that stations like WRST Soft Rock/AC (Adult Contemporary), which caters to a Female audience, has a 59% loyalty rating and a 1.7% Turnover. Both AC stations carry a more loyal Female listener base and have Turnovers rates less than 2%. In the end, I decided to select WMMG-FM CHR, which has 34% listener loyalty with a 2.9% Turnover rate. WMMG-FM caters to a teenage audience that will soon enter into the coveted 18-49 market. Moreover, I believe that these three stations, combined with WZBR AM/FM, are the best choices for acquisition by the Umphrey Broadcasting Network. Albarran, A. B. (2016). 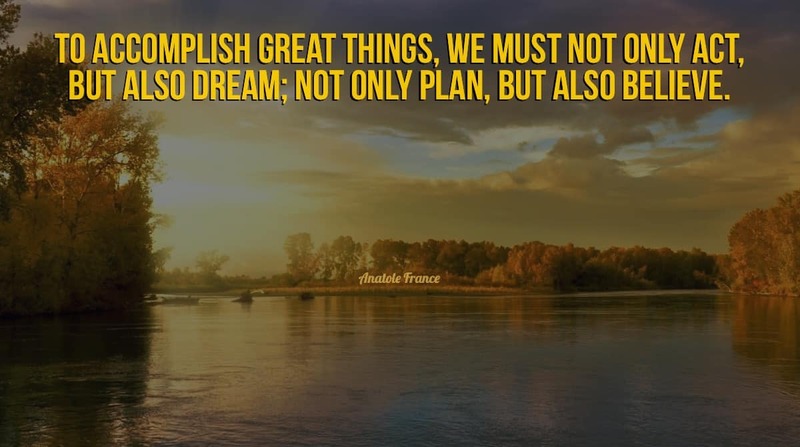 Management of electronic and digital media. Nelson Education, 160-161. Favorite music genres among consumers by age group in the U.S. 2017 | Survey. (n.d.). Note: Articles Available for Peer Review. check out your blog on my iphone during lunch break. I enjoy the info you present here and can’t wait to take a look when I get home.